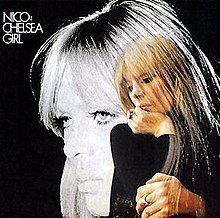 L.Jones recently put “These Days,” a track off Nico’s 1967 album Chelsea Girl, on the latest volume she gave me. While an old classic, it was popularized by being on the soundtrack for the movie The Royal Tennenbaums. Starting off with a delightfully catchy guitar riff, Nico slowly draws you in with her deep and somber voice. At first Lauren couldn’t tell if she liked her voice, however what makes her different is what makes her so compelling to us. Far from a whiny male vocalist, shes speaking of things undone and regrets she would rather not have to face. Its a relief to hear a song with such melancholy honesty; it almost makes me feel content despite the somber tone.